N: Aside from the smoky sootiness, the pastry and the marine/Coolmint-fresh, which make up an amalgamated note, I focused on three distinct profile camps. The barley, the attentive [vanilla] oak and the sweet fruitiness – apple=pear tarte Tatin<orange=tangerine yes, but mostly its sweet lemon+lime sugar-sherbet and a touch of frangipane]. Also to be commended is the high flavour intensity coupled with an inviting softness to the whole. And i didnt even mention the biscuit-charcoal<toasted-ness that develops from that sooty smokiness.Time reveals a malty heart that breathes & pulsates. After an hour, the putty-malt really starts to grow. A cardboard note is often seen as a dirty word in whisky but I’m having none of it. Recently i’ve had Inchgower, current Dufftown, Teaninich, Blair Athol,.. etc, all of which have shown brilliance whilst a little boxed in. This is honeyed corrugated cardboard & flour=paper mache, also with salt n vinegar seasoning, peaty [fresh, sweet cow pats], feta cheese [appearing more than another hour later. Then there’s the bourbon medicinal side, mainly showing through bourbon-led candy notes – Hubba Bubba the most obvious! All of this complexity comes with subtleness that always refers back to the savoury barley-cereal heart. I’m bored with the word ‘faultless’, but ho hum there it is. Serge says regarding this 12yo, “I can’t seem to find anything bad to say about this nose”. And thats the nose done! Have we time for anymore? T: This is oaky distillate but it’s the casks serve the spirit. Dry yet spritzer-like salivation with a dill-sprinkled lemonade/vanilla quality before the velvet=waxy=soot, oak and savoury=sweet spirit gets to work. Follows through with a raisin/malt core. The complexity grows on development. Water management is fairly important but again, time is more crucial to get the best. This is absolute value for money and one of the best entry level drams that are available at this point of time. 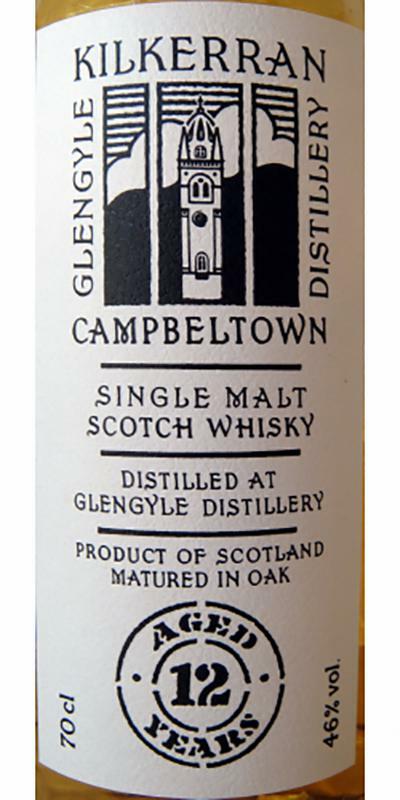 Campbeltown peat smoke ;) It's putty-like, earthy, sooty and mossy. Apart from that, it's like Apple Strudel with cream and vanilla sauce, salted almonds and some lemon. The palate is pleasant, easy to drink, and medium to full bodied. The nose is continued, the soot and putty are quite pronunciated. Then there is pastry, soft fruit, and a hint of rum soaked raisins. A hint of peach, vanilla and soft pepper complement this beautiful palate. Long, well balanced between sweet and sour, and not bitter at all. Dried fruit seems to dominate, the smokiness has gone to the background. Between that, there is creamy and rich malt, with ample vanilla. 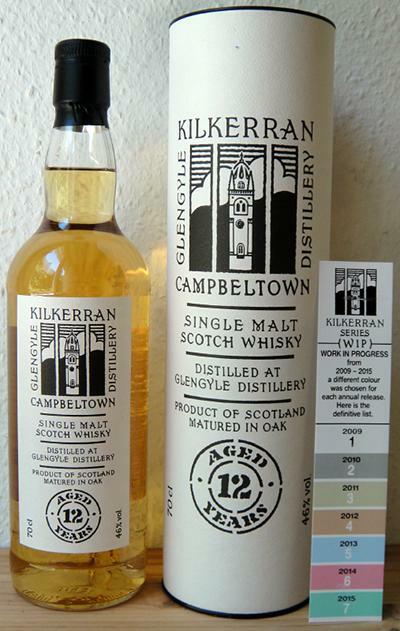 The aroma of malt-pepper, lemons, oranges, a small patch of peat and salt, apples, lay dried fruit, sweet spices. The taste is full, rich, sweet-pepper, caramel, vanilla, smoke and lemon notes. The finish is medium length, pepper, a little salt, oranges and lemons. Very spicy and rich flavor aroma molt. In my opinion, the taste here plays a dominant role, very complex and complete for a 12 year old molt. After the sip, the aroma acquires very interesting musty-fruit-berry stories, which I consider to be more like notes than of-nots. Deserves a good rating, tasty molt. The first 12-year-old from this small distillery is by and large one of the most individual new standard bottlings I have come across in a long time. On top of that it has got a smashing bfyb-factor . Initially rather sweet and tangy, then something 'disturbing' in a positive way: distant peat, cow dung (not like Ledaig, but in that direction) or also rotten hay, in any case something pungent, graphite-like. I can understand that it is not for the faint-hearted due to its rough edges. Soft and supple in the mouth, oily, salty, no, very salty, then a slight bitterness widens, it becomes mineral and astringent. I like it much better with a few drops of water. 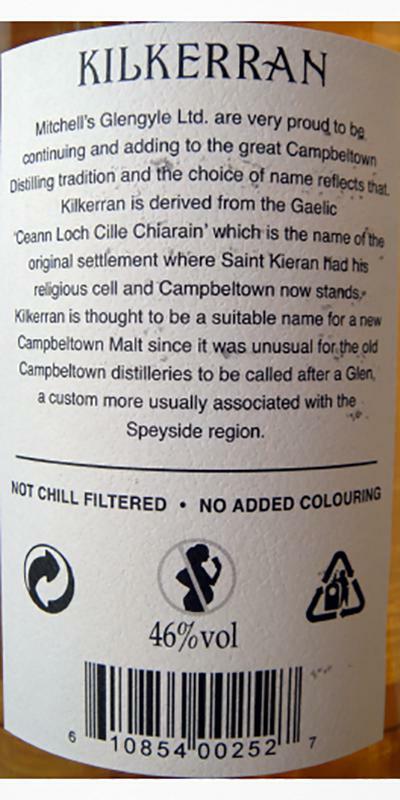 It is heavier on the palate than a Springbank 10 or Clynelish 14, for example, but also more multi-faceted. 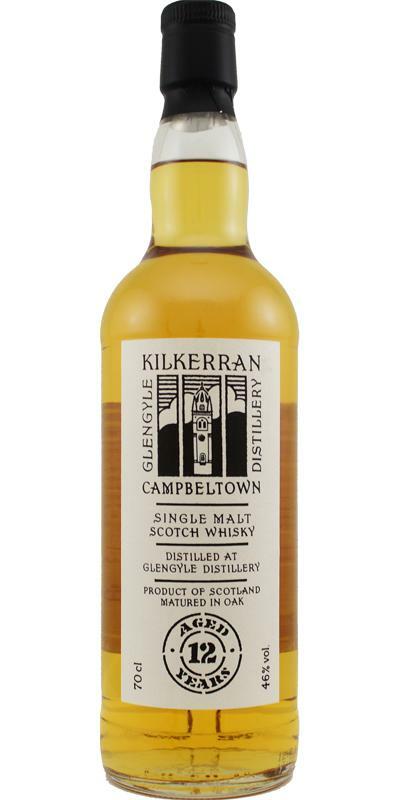 In my opinion, this is a down-to-earth, beautifully made no-nonsense Campbeltown whisky. Very dry and not sweet. Reminiscent of those delicious salted Marcona almonds and sherry fino extra dry. Overall harmonious. I totally dig this oily saltiness, with just a wisp of smoke added. The best Kilkerran release so far. Better than the WIP 7 and 8-yo CS. Strong Springbank-like profile. Decent amount of peat. Somewhere between a Springbank and Longrow profile. I love it. Beautiful Nose. Great fruit. Light oak but more medicine. Round, fresh and fruity. Sweet. Oak and spicy. Beautiful finish. He rolls over the tongue vigorously, leaving behind fruity and slightly oaky notes on the palate. Oh yum, what a dram! Not as oily or richly fruity as last year's bourbon release (well, why should it be the same - it has 30% sherry cask matured whisky), but there's a light peat, light fruits, a salty and a mineral note. An almost austere whisky, a style almost lost today, which I really, really like! A very pleasant dram that I certainly get in full bottle to be able to enjoy it at any time. Long, peppery, a little honey-sweet vanilla but especially the light peat makes it a perfect dram for every day. 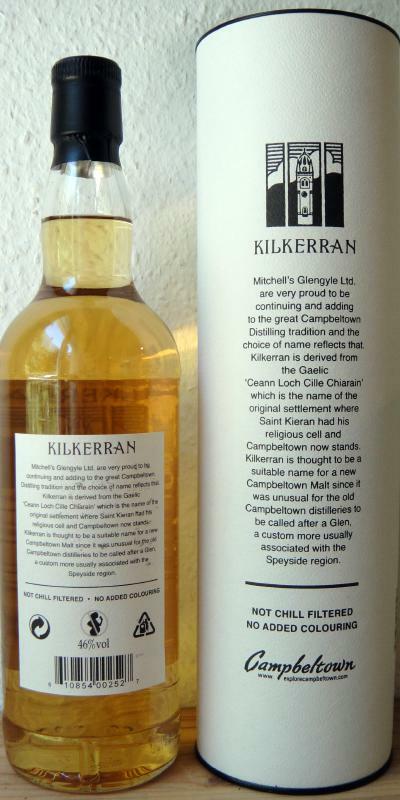 Another very nice Kilkerran, clean, clean and without smudge. Sweet smoke, sweet spices, fresh fruits, citrus fruits and precious woods. Lack of peps, spices, cooked fruits, stewed and light bitterness. Sweet spices, floral, creamy on the fruit yahurt .... light return of the smoke.